Big Brother 12 premièred on July 8th and concluded with the live finale on September 15th, 2010. Hayden Moss was crowned the winner with Lane Elenburg being the runner-up. Kristen Bitting seems to get a lot of attention for a Big Brother Player that lasted only 4 weeks in the game. She’s been able to leverage some of her BB fame into promotional modelling as a extra on small TV Rolls. Last week we caught her on Betty Whites Off Their Rockers where she played a “Greek Goddess” Feeding grapes to a elderly man. Before that we caught her demoing a “Reverse Triangle from Single leg Position” in a sherdog Fight videos and modelling with Rachel Reilly in Kasanova magazine. This week we find Kristen on the dating show Baggage hosted by Jerry Springer. Kristen is the second Big brother Alumni to be on the show, the first was Michelle Noonan. Baggage is a dating game with 4 contestants who are trying to get a date. One of the contestants gets to choose which of the other 3 they want the date with. The 3 contestants each have a suitcase with them, one is small, medium, and large. Each one contains a secret which is called the contestants “Baggage”. The larger the “baggage” (suitcase) the more scandalous the secret will be. 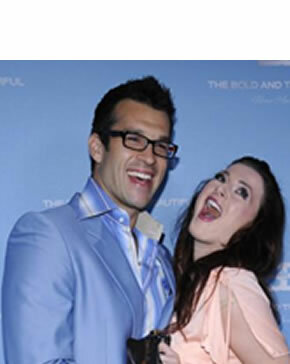 Kristen “baggage” was ” I cheated on my boyfriend while on national television” (Her showmance with Hayden on Big Brother 12) In the End the guy picks Kristen to go on a date and Kristen accepts. The Guy had his own baggage which was “if you marry me you also marry my mother” Kristen’s reply to that was that she doesn’t like Momma’s boys but she is also very close to her mother so she wants to try the date. Big Brother 12 Kisten Bitting was on Season 1 Episode 2 of Off their Rockers staring Betty White. Episode 1 of the show was on January 16, 2012, it was a special sneak peak to pay tribute to Betty White’s 90th birthday. It’s crazy that Betty white is 90 and can pull off a show good for her. Kristen was playing a greek goddess laying on a couch with a geriatric. Betty white says something like she’s running around town with young studs but the old fellas need love to. She looks at the old man and he says “I think I’m going to have a heart attack” Betty White replies “I’ll get the paddles” The entire time Kristen just smiles at the guy and feeds him grapes. The other greek goddess removes the guys hat and strokes his hair. There was no lines from either goddess. This episode of Off Their Rockers was filmed December 12 of last year. Big Brother 12, Big Brother 13 Winner and Amazing Race contestant (Still in the race) Rachel Reilly has a new project on the go called “Adventures4Pets”. We first learnt about this web show last month during Rachel’s appearance on BearPaw TV. Two Sisters Rachel Reilly, Elissa and their pets hit the road to find the most pet friendly destinations in America. Adventures4Pets.com site is not live yet, the splash screen says April sometime.. Rachel is starting to publish the videos on youtube. In this episode Rachel and Sis head to San Diego for a “Pet-Cation” which she calls one of the most pet friendly cities in the US. Last weekend Big Brother 12 America’s Favorite Britney Elizabeth Haynes of New York married Nathan Ryan Godwin of Tulsa son of Stuart and Terry Godwin of Mansfield. Wedding invitation for Britney Haynes wedding. Looks like the Wedding happened on March 18th at 3:00pm at the Pratt Place Barn, 17 n. Elizabeth Street fayetteville, Arkansas. 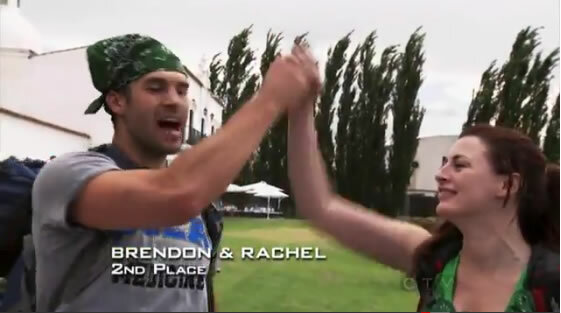 Brendon and Rachel Big Brother exploits need no introduction on onlinebigbrother. We’ve followed their every move on the Live Feeds for the last two BB season (BB12 and BB13). With last year finally witnessing the unthinkable Rachel Reilly becoming the Big Brother Winner, all while surviving Fan/Houseguest ridicule, countless BB Fights……….. Both Rachel and Brendon will rip through TAR20 and if they don’t expect them on Big Brother 14 this year because that’s the way AG rolls. Rachel Reilly won the $500,000 grand prize last month on Big Brother 13. Now she’s working for tips on The Bold and the Beautiful! The marriage-crazy redhead will return to the CBS soap October 28 and 31 as Rachel, a saucy cocktail schlepper at the Bikini Beach bar, and she’ll have her real-life fiancé (and fellow Big Brother player) Brendon Villegas in tow. The future Mrs. V gave TV Guide Magazine the lowdown. TV Guide Magazine: What’s with all the B&B love? This is your 10th appearance! Reilly: I know! Isn’t it crazy? [Laughs] And this time I’m a bride! Brendon and I are part of the Halloween shows so they put us in wedding outfits, which of course I loved! We’re getting Bikini Beach ready for a party. Amber [Adrienne Frantz] is there flirting with Thorne [Winsor Harmon]. The costumes and makeup are so fantastic you’re going to be shocked! We have swamp creatures, pirates, gypsies, mermaids, fairies, geishas. I was a cocktail waitress in Vegas for years and this trumps any Halloween party I ever worked there. It really inspired me for real life.